This week Deputy Premier Jeff Seeney put ASF and GCCC on notice for the lack of consultation and lack of community support for their proposed plans. Jeff Seeney backed local MPs Rob Molhoek and Verity Barton who have been listening to local residents and clearly believe there is a lack of support for a CST. 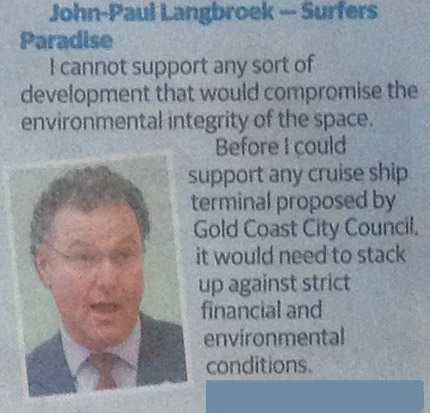 These MPs including John Paul Langbroek have unambiguously stated their positions. The announcement by Deputy Premier Jeff Seeney that the Spit will be retained as parklands north of Seaworld Nara is a clear sign that the many local voices against these proposed plans have been listened to. This announcement in itself is cause to celebrate. 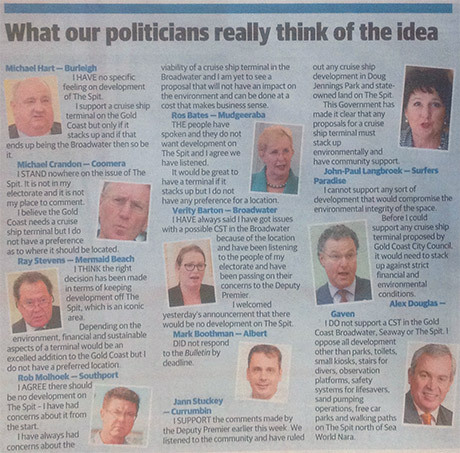 It is a clear indication that the Gold Coast community views are being considered by our MPs. SOSA and other community groups have had contact with the MPs listed above - they have consulted and taken the community requests onboard. Hence the comments by local MPs listed below are an important step in our aim to permanently preserve this entire area for future generations. Clearly this is not over however the intentions of local MPs should be apparent to both ASF and Mayor Tom Tate. Your plans do not have community support, continue at your own peril. The wise decision would be to abandon pushing any further development in the Broadwater and avoid risking further alienation and or financial loss. The audio contains just a few snippets of some very forthright views from Tom Tate including claims of 36,000 jobs then later 10,000 jobs (same interviewer and interviewee a few months apart) - judge for yourself - would you put your trust in the ever changing claims from our Mayor (seemingly a conflicting stance from lunch to dinner) or in contrast the considered views of the MPs above?